-We found out more on what happened on the day the artificial sun flickered. -Lag’s situation seems to be getting more interesting. Aria along with Niche finally arrive to their destination and it turns out that the letter they are delivering to, is a survivor from the airship that crashed in the day the sun flickered. There he reveals to them what he saw the day. Meanwhile, Dr. Thunderland tells his version of the story to Lag. Oh yeah, almost forgot, there’s a new opening and ending. Personally,I think the opening is boring >_< The ending, though, is pretty nice. 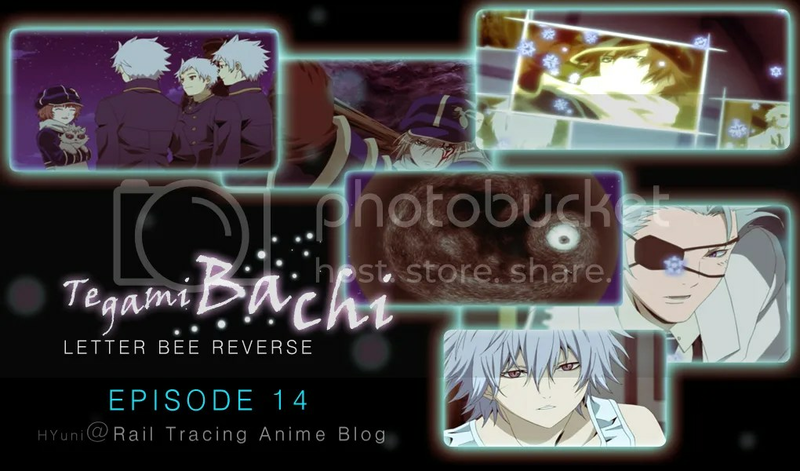 This entry was posted in Anime, Currently Watching, Tegami Bachi Reverse and tagged tegami bachi reverse. Bookmark the permalink. Yea! I was so happy when Gauche woke up and he was reunited with Lag and his sister. It was so heartwarming!!! The sun on the other hand, freaked me out a bit. Hmmm but I don’t think that Lag is the artificial sun, idk I just think the sun… is just a freaky sun that’s alive. wow, I learned and understood so much from this episode. It’s pretty weird how an embryo-like thing is the form that the artificial sun takes. It was interesting to see some of the characters when they were young and how they were somehow connected to one another in the past. I thought both the OP and ED were nice.